These Fruit Explosion Jumbo Muffins are great muffins for a weekend breakfast or brunch…or really any time! 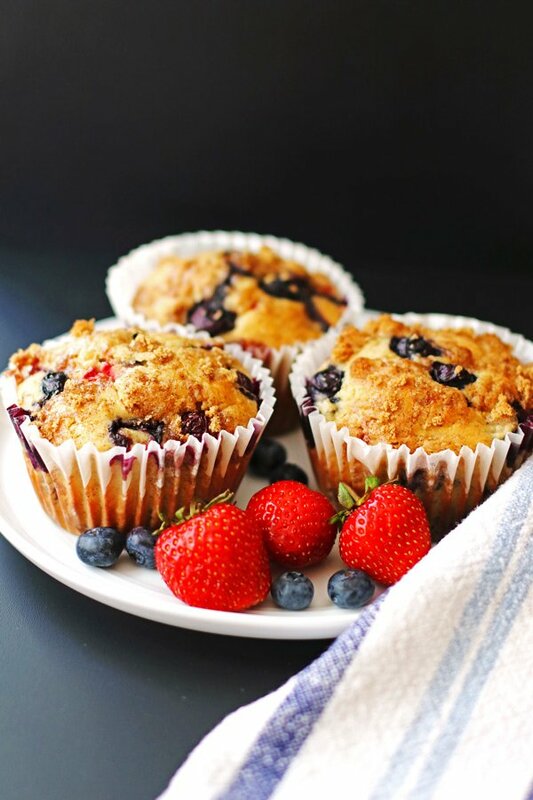 We call them Fruit Explosion because we use banana, blueberries and strawberries and together the flavors just explode in these muffins. 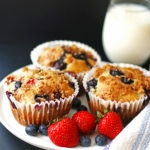 And, they are made jumbo size so you get even more delicious sweetness in these muffins! So many to choose from, it is hard to choose just one, isn’t it? That’s another reason why I put in a few fruits…some of our favorites mixed in one muffin together. When making these, make sure to use a jumbo muffin pan , like this Wilton 6-Cup Jumbo Muffin Pan from Amazon. There are different sizes for muffin pans so make sure to use that size for this recipe. These are pretty easy to make and kid friendly too. Kid friendly… a recipe that is one that kids can help out with and will also love to eat. My daughter is a fruit lover and loves these muffins. My son on the other hand, is more of a chocolate lover when it comes to sweet stuff, but still loves these muffins. They are so sweet and delicious it is hard not to like them. The butter needs to be softened when making these, but if you should forget to take it out ahead of time, a quick trick it to cut the butter into small pieces. I actually had to do that this morning when making these muffins. I cut the butter into about ½ “squares and let them sit until I was ready to use the butter and it was easy to mix in with the other ingredients. Do you have a pastry blender? It is a kitchen tool that works great with combining all your dry ingredients in this recipe. I had never heard of such a thing until I made my mother-in-law’s apple pie recipe. Did you ever think they should add in another marriage vow, stating that “I will try to make all my husband’s favorite recipes from his mom or grandmother”…. I will tell you though; that my Apple Pie recipe is one I adapted from my mother in law’s recipe and it is one of my top recipes on my blog. There is something about those handed down recipes, isn’t there!? The pastry blender is something my mother-in-law told me to use for that recipe and I also use it with other recipes like this one for muffins. This is a perfect time to make these Fruit Explosion muffins since it is berry season right now. 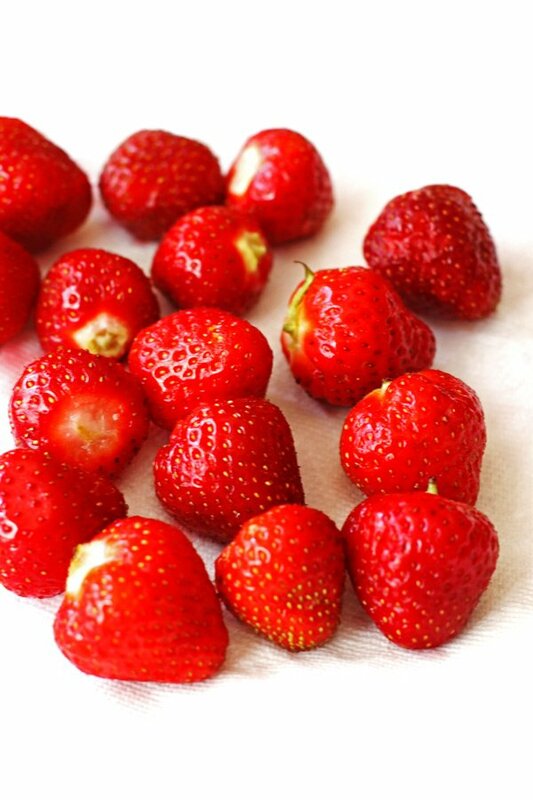 Fresh berries from the farm…yumm! Use a “heaping” cup of fresh berries. Be generous with that measurement. Gently fold the berries into the batter. This way they will keep their form. 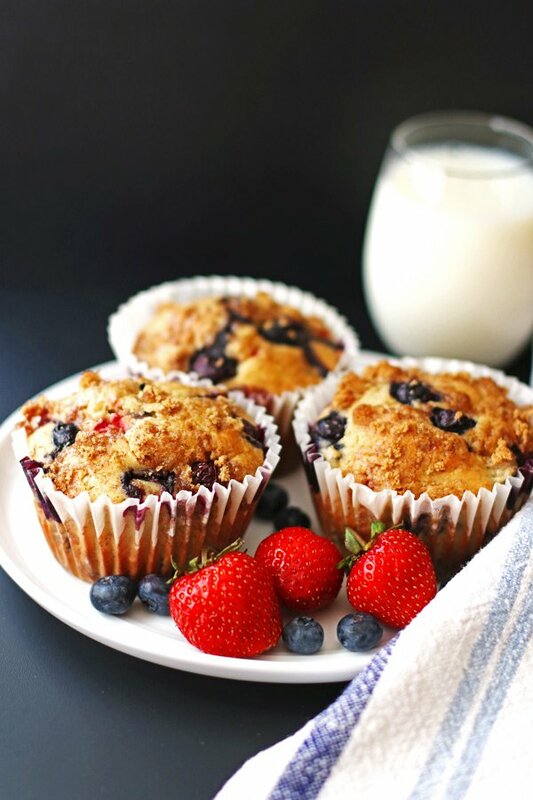 Make sure you a good amount of berries in each muffin cup. This way each muffin gets the fruit explosion flavor. Alright, go get your bananas and fresh berries and start baking! Let me know how you liked them. Like this recipe? You can find all my recipes on Instagram and Facebook. Follow along for all the great family friendly recipes! Rinse the fruit. Let the fruit dry on paper towel while preparing the recipe. Dice up the strawberries. Mash the bananas in a bowl and set aside. Using a pastry blender or the back of a fork, blend together the flour, sugar, butter, baking powder, salt and the cinnamon. Add in the eggs into your large mixing bowl, beating after each one. Add in the milk and vanilla and mashed bananas. Mix well. Using a spatula, gently mix in the berries. 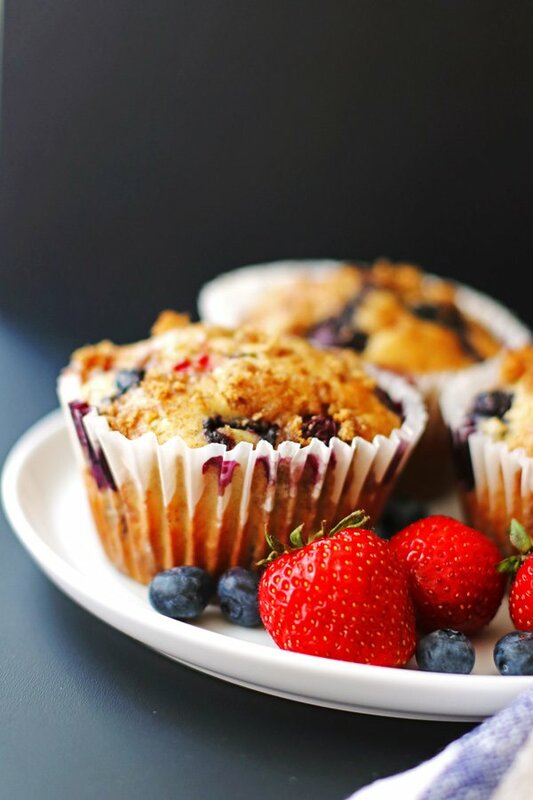 Place a few berries on top of each muffin before baking. For the topping, combine ¼ cup brown sugar and ½ teaspoon ground cinnamon. Sprinkle a little on each muffin before baking. Recipe makes 8-10 jumbo muffins. Hi Susan! Great idea to add the chia seeds to the muffins! So glad you made the recipe and liked it! Thanks for letting me know!